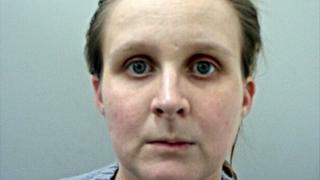 A mother jailed for murdering her newborn baby with a pair of scissors will be tried again after judges quashed her conviction. Rachel Tunstill was sentenced to life for killing Mia Kelly shortly after giving birth in the bathroom of her flat in Burnley, in January last year. The care worker, 27, had denied murder due to diminished responsibility. Judges at London's Court of Appeal said the jury should have been given the option of an infanticide conviction. The rarely-seen offence is defined as the killing of a child under 12 months by his or her mother, while the parent's mind is "disturbed" due to giving birth. Tunstill was originally found guilty of murder after a trial at Preston Crown Court, and ordered by Judge William Davis to serve a minimum of 20 years. The jury heard she had called for her partner Ryan Kelly, who was playing on his games console, to pass her the scissors. As he handed them through the bathroom door, Tunstill said: "Thanks babe", before closing the door. The trial heard Ms Tunstill killed Mia before wrapping her up in two plastic carrier bags and dumping her in the kitchen bin at her flat in Wellington Court. Lord Justice Treacy gave his judgement after hearing the appeal with Mrs Justice Yip and Judge Geoffrey Marson QC earlier this month. In quashing the verdict, he said the murder conviction was "unsafe" and ordered a retrial. He said two psychiatrists at the trial supported a defence of infanticide, while another rejected it. Lord Justice Treacy said: "It seems to us that there was evidence capable of showing that the balance of this appellant's mind was, at the time of the killing, disturbed. "The evidence of the two psychiatrists relied on by the appellant was to the effect that the appellant's pre-existing condition, taken together with the effect of having given birth, was the cause of that disturbance of the balance of her mind."